Not everyone realizes the necessity of a high-protein post-workout meal, but for optimal muscle growth and recovery, a high-quality dose of post-workout protein is crucial. It’s quick, easy, delicious, and includes superfoods like chia seeds and avocado for taste and texture. Be sure you choose a high-quality, grass-fed protein powder that’s not only excellent for strengthening and repairing muscles, but can also help with weight management, fat loss, and blood sugar regulation. 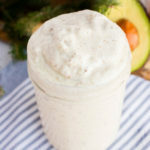 Whether or not you follow a low-carb diet, this keto-friendly post-workout protein shake will help you recover from tough workouts, gain lean muscle mass, and the best part? It actually tastes like a real milkshake. Whey protein is one of the best-studied protein powders for muscle growth and fat loss[*][*][*]. The amino acid content of whey is the primary reason it encourages muscle growth and promotes leanness. This milk-derived protein is packed with branched-chain amino acids (BCAAs) and other bioactive compounds that are crucial for muscle growth, body composition, recovery, and even bone health. Another important compound that often gets overlooked in whey is lactoferrin, which promotes healthy bones, optimal iron levels, and a strong immune system[*][*]. Whey protein also promotes post-workout repair and recovery and may reduce the risks of age-related muscle loss[*][*]. The chia seeds in this recipe are an excellent source of calcium and manganese, which are important for bone health[*][*][*]. And full-fat coconut milk contains a number of essential micronutrients for bone health and muscle function such as magnesium, potassium, and other electrolytes[*][*][*]. Whey protein assists in weight management and provides your body with an array of amino acids that can enhance strength and increase your energy levels[*][*]. Almond butter also offers a natural abundance of healthy fat and fiber, which can curb your appetite and reduce cravings. Studies show that regular consumption of almonds can promote healthy cholesterol levels and help you maintain a healthy weight[*][*]. Chia seeds pack a punch in the fiber department as well, with 11 grams of dietary fiber per 30-gram serving. Consuming chia seeds helps keep you hydrated and feeling full after meals. Studies confirm that chia seeds provide appetite reduction and weight loss[*][*]. Whey protein may help balance blood sugar levels and support a healthy metabolism. Chronic high blood sugar is the cornerstone of insulin-resistance and, ultimately, type 2 diabetes. Keeping healthy blood sugar and insulin levels, on the other hand, can reduce inflammation and lower your risk of dementia, type 2 diabetes, and heart disease[*][*][*][*]. Almonds help you keep blood sugar levels in check[*]. They also provide significant benefits in terms of heart health[*]. Much like almonds, avocados are also rich in healthy fats and fiber. These nutrients help keep your blood sugar at normal levels, promote healthy aging, and enhance heart health[*][*]. Because chia seeds are high in protein and dietary fiber, they’re another excellent option to balance your blood sugar. Multiple studies of human subjects and animals confirm that eating chia seeds can improve insulin sensitivity and lower risk factors for heart disease[*][*][*][*][*]. Coconut milk provides a delicious, sweet flavor with just 8 grams of net carbs per cup. Including coconut milk in your post-workout shake not only improves the texture — it also enhances the health benefits of your recovery drink. Coconuts are an excellent source of healthy fat and have been shown to support optimal levels of blood sugar and cholesterol[*][*]. All you need is a blender, some almond butter, an avocado, chia seeds, some coconut milk, Perfect Keto Vanilla Whey Protein, and you’re set! If you tolerate dairy, you can add a tablespoon or two of heavy cream for even more healthy fat and a creamy texture. If not, feel free to add a scoop of MCT oil or MCT oil powder for a high-fat boost. The most important point is that high-fat, low-carb smoothies can aid in weight loss, and protein intake is even more important when you’re lifting weights or going hard at the gym. Use this smoothie as a delicious amino acid-packed breakfast or pre-workout, or save it for a post-workout treat to help your muscles regenerate and repair. With almost 9 grams of protein per serving and 15 grams of protein for two servings, this is a fat-burning shake you’ll want to add to your keto-friendly meal plan. A ketogenic post-workout shake made with high-quality whey protein — formulated to promote fat loss, enhance recovery, and increase lean muscle mass. Add all ingredients to a high-speed blender and blend until combined.